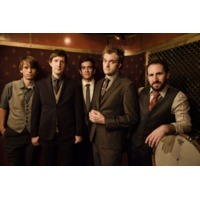 Punch Brothers are a bluegrass band consisting of Chris Thile (mandolin), Gabe Witcher (fiddle/violin), Noam Pikelny (banjo), Chris Eldridge (guitar), and Paul Kowert (bass). Bryan Sutton has also filled in on guitar when necessary. Their style has been described as introducing "bluegrass instrumentation and spontaneity in the structures of modern classical."